A little more than a year ago the Society of Grownups, a two-year Mass Mutual experiment, abruptly shuttered its doors and took its financial literacy courses online. 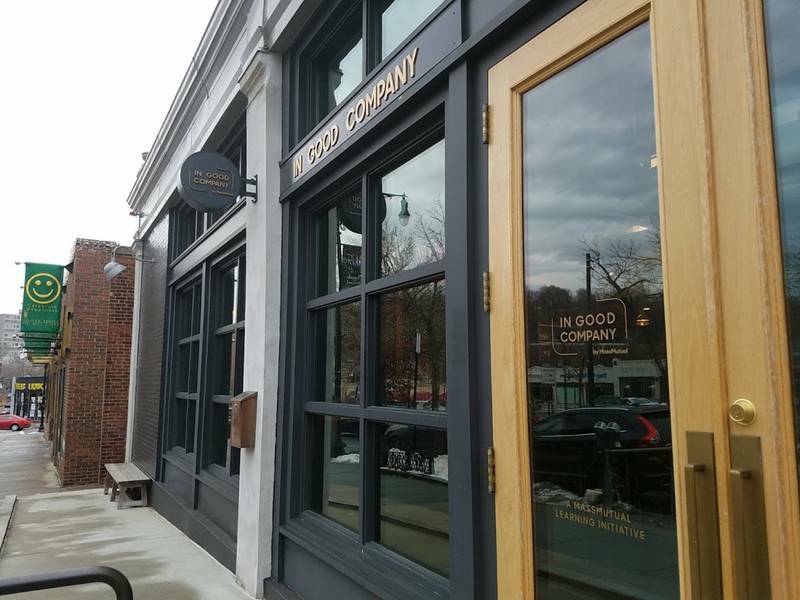 The storefront space wedged between Golden Temple and Starbucks sat empty until this month when a sign went up in the window and “In Good Company” popped up, using the space, noting it, too, was a Mass Mutual endeavor. In Good Place, according to the website is a place where people who want to improve their financial intelligence come together to get advice from experts who speak their language (the human one). It promises no jargon, no sales pitches, no three-piece suits. The website describes it as a descendant of Society of Grownups, with a mission to continue advancing financial education in the community. “We’re here for grownups, aspiring grownups, and even well-established grownups, because everyone wants to understand money better,” reads the website. And right away for anyone following along at home; the big difference seems to be that unlike Society of Grownups, which was a MassMutual initiative but you had to go digging to find that in the FAQ, the space is advertised as a collaborative between MassMutual and Baystate Financial and is front and center on the website. “You can still come to learn then leave – or learn, grab a beer, then leave – if that’s what works for you. But, if you’re ready to act on what you’ve learned, you can continue the conversation beyond the classroom with a Baystate Financial adviser,” it reads. The first few classes listed on the calendar appear to be free and range from course on planning for the new year when it comes to finances, to financial tips when having a baby to learning the basics between stocks and bonds and mutual funds – through wine.